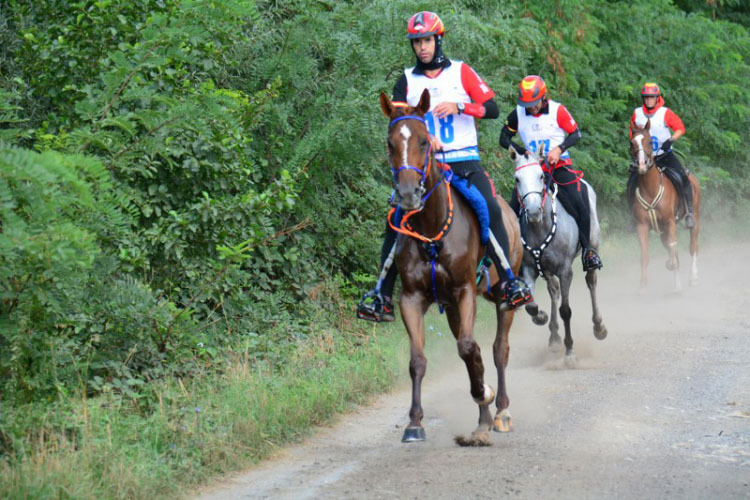 Jaume Punti Dachs and the 14 –year-old mare Ajayeb (Tidjani x Gharam by Dynamite III) were first across the line in 7 h 5 mn and 13 s, averaging 22,58 km/h, followed a second later by Dutch Marijke Visser and Laiza de Jalima (Ismael d’Aubanel x Pirula by Piruet). It was a finish that included a sprint that you usually see on a racecourse. Jean-Philippe Frances and the Anglo Arabian Secret de Mon Cœur (Ismael d’Aubanel x Kobald de St Laurent by Calin de Mels), 2013 Young horse World Champion, was not far behind, finishing 8 mn et 17 seconds later. Alex Luque Moral and Calandria PH took fourth place, followed by Maria Alvarez Ponton on Selif de la Nie (Nabath HN x Moukala bint Fata by Fat), bringing gold once more to Spain, this time a team medal. The silver team medal was won by France thanks to the ninth place obtained by Nina Lissarrague and Keeshan d’Aillas (Persicko HN x Diona by Oulili Quintana) and the 11th place of Enora Boulenger and Guarfao de Bozouls (Fouazi x Guardiola de Bozouls by Rim). The bronze medal went to Holland thanks to the individual gold medal of Marijke Visser and the 17th places of Carmen Römer and Siglavy Bagdady Zeusz (Siglavy Bagdady XV-5 x Gazai XIII-2 by Balaton) and Melisa Huijsman and Kain (Sheikan Star x Hamasa Fasiha by Farag). * Only the first three of each team count towards the team rating.